Platinum Games may port the next Metal Gear if there's enough demand. Metal Gear Rising: Revengeance (which I will still never be able to type with a straight face) is due out later this month for the PS3 and Xbox 360. A simultaneous release on the Wii U won't be possible (fifteen days isn't a whole lot of time to develop a port), but hope springs eternal within the Metal Gear fan's breast. One fan recently inquired whether a port for Nintendo's new console was in the cards, and received a fairly gentle rebuff. 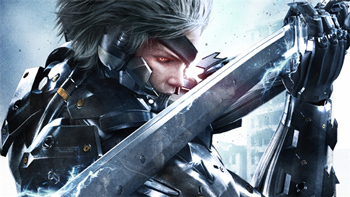 However, if developer Platinum Games learns that there is a ton of demand for a Wii U version of Raiden's latest adventure, it might just happen. "What are the chances of MG:R getting a Wii U release one day?" asked a Twitter user by the name of Sneferie. "Touch screen would be cool for finishers and other shenanigans." She directed the message towards JP Kellams, a game writer and translator for Platinum Games in Japan. Although Kellams does not seem to have any direct involvement with Revengeance (there's that word again), he still fielded the question. "Would have to see demand for it and bring us the request to port," Kellams replied. When others joined the conversation to add their requests to Sneferie's, Kellams pointed them towards earlier tweets he made on the subject. "Tweeting me about [Wii U ports] is not the right path." Platinum Games, he reminded them, is a developer, and "publishers make platform decisions. Tweet them." He added that he's pleased by passionate fan interaction, but he and his parent company have no control over the systems for which a product releases. The outlook for Revengeance (no one else finds the humor in this?) on the Wii U is admittedly not great, but according to Kellams, it isn't impossible, either. If fans do organize a massive Twitter campaign towards publisher Konami, expect that this won't be the last time you hear his name.